A Blog Named Sue: I will never be this cool. Ever. 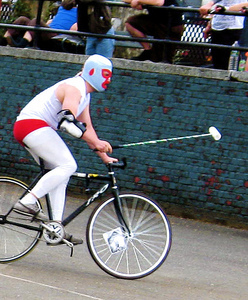 Viva el luchador que juega el polo en su bicicleta! Viva! Or something. Shoot. Photo by Trixie Bedlam. Found it here. Actual, substantive posts coming soon. Meatspace devours me. This month's Vanity Fair "Green Issue" is chock full of eco-apocalypse goodness, and mercifully free of any scratch and sniff cologne ads. One article in particular stands out for me: Robert F. Kennedy's memoir of becoming an environmentalist via the sport of falconry. (Sadly, it's not available online.) At one point in the article he describes the accepted technique for acquiring a wild peregrine falcon to train as your own personal killing machine: you go to a beach along the peregrine's migration route and bury yourself in the sand up to your neck. One hand is also left free above the sand. Your assistant places a wire cage over your head that's been camoflauged with grass and assorted beach flora, and then places a live pigeon in your free hand. And then you wait. When a peregrine, famished from its migratory exertions, swoops down to eat the aforementioned pigeon you let go of the pigeon and grab the peregrine by its feet. Congratulations! You're now holding a very angry creature with very sharp talons and an equally sharp beak. Damn. I will never do anything that cool. Ever.